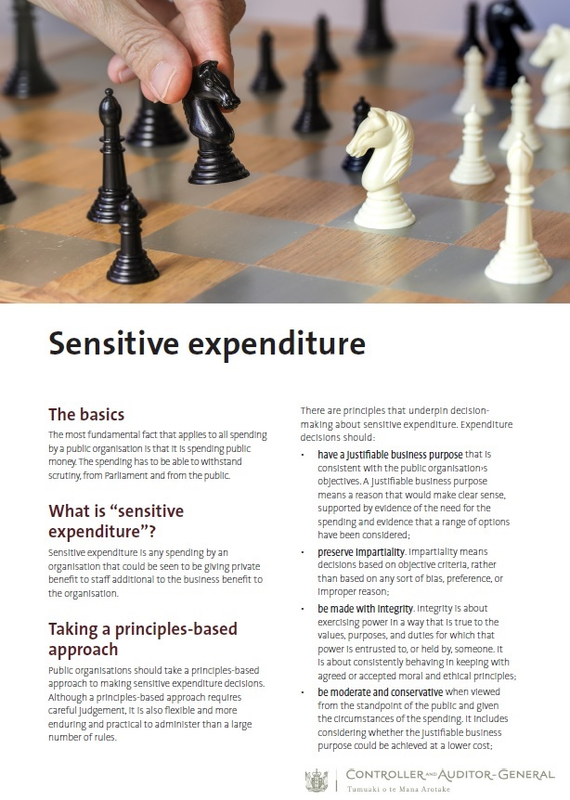 Public organisations, and individuals making sensitive expenditure decisions, should consider the types of sensitive expenditure outlined in this section. These types of sensitive expenditure are not an exclusive list or a set of rules. Rather, they list issues in the main types of sensitive expenditure as we see them. Expenditure on travel and accommodation, especially by leaders and senior managers, is one of the types of sensitive expenditure most often brought to our attention. The principles of a justified business purpose, and moderate and conservative expenditure, are particularly relevant. Travel and accommodation expenditure should be economical and efficient, having regard to purpose, distance, time, urgency, and personal health, security, and safety considerations. outline the monitoring and reporting arrangements. For more information and guidance about expenditure for travel and accommodation, including the types of travel and accommodation expenditure, please see Part 4 of our good practice guide. Entertainment and hospitality can cover a range of items from tea, coffee, and biscuits to catering, such as meals and alcohol. It also includes non-catering-related items, such as entry to a sporting or cultural event funded by the public organisation. pre-approved, with clear and appropriate limits on quantities and use of alcohol, if any, and is substantiated by appropriate documentation that includes receipts, names of parties entertained, and the reasons for the entertainment and hospitality. Part 5 of our good practice guide has more on the issues and principles about entertainment and hospitality expenditure. This relates to obtaining, disposing of, or using goods and services that are not covered by the terms and conditions of employment. For more information about the different types of good and services expenditure, please see Part 6 of our good practice guide on sensitive expenditure. Public organisations may provide for staff support and welfare in a range of ways. However, a public organisation also needs to bear in mind that payments for staff support or welfare that could be seen to meet what are ordinarily a staff member’s personal and private expenses can amount to additional remuneration for the staff member. For more detailed information and guidance, including the different types of staff support and welfare expenditure, please see Part 7 of our good practice guide on sensitive expenditure. For principles and guidance on expenditure for corporate boxes, donations, koha, communications technology, and gifts, please see Part 8 of our good practice guide.